Jed Hoyer and Ben Cherington have been named co-GMs of the Red Sox in a “restructuring” of the baseball operations department. Following please find the transcript from today’s press conference that introduced Hoyer and Cherington. Red Sox president Larry Lucchino: We know we’ve made it a fairly busy offseason, hot stove season for you all but we have an important announcement that we want to make today and that is that we’re taking a major step forward in the internal restructuring of our front office, or our baseball operations department, and we are very pleased to announce we have taken the broad duties and extensive demands of the general managers office and have divided them into two, and that those duties will be shared by the two gentlemen sitting next to me, Jed Hoyer and Ben Cherington. Both are experienced members of our front office. Ben is going into his eighth year with the Boston Red Sox. Jed is going into his fifth year with the Boston Red Sox. We are enormously proud of the work that they have done already in their career. They have been major contributors in a variety of different areas to the success of this club and to the success of the club on the field in particular. 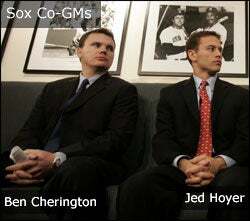 So it is with an enormous sense of pride and satisfaction that we announce to you that the co-GMs of the Boston Red Sox going forward will be Jed Hoyer and Ben Cherington. Let me add one more comment about the process and how we got here. After Theo Epstein’s decision to decline the offer for an extended contract, we began in early November, an extensive search for the GM. Our plan was to do that in two stages. The first stage was to talk to external candidates, and we spoke with quite a few. I’ve got a file in my office about this thick (finger and thumb split wide apart) of people who wanted to apply or did apply, or did ask us to consider their candidacy for the position here. We spent a fair bit of time talking to these external candidates, many of whom have been identified for you, some of whom were not. But the second stage of the process began recently; I would say a week or two ago, when we began to explore internal possibilities and an internal restructuring. And as a result of that process, we… John Henry, Tom Werner, and I… are proud to be able to say that we have, in our own organization, the people with the talent, and the intellect, and the drive and the ambition to do this job and we think to do it very, very well. So I think it’s a great day for these two guys. It’s also a great day for the state of New Hampshire. The Granite State should be particularly proud today; we have two native sons, from Meriden (Cherington) and Plymouth, New Hampshire (Hoyer). So the New England franchise will… the baseball operations department will remain in the hands of born and bred New Englanders so it’s with great pride and satisfaction that I say congratulations and good luck. GM Jed Hoyer: First of all I just want to thank John, Tom, and Larry for showing this confidence in Ben and in me. We will do everything we can to make sure we live up to those expectations you’ve given us. The second thing I want to say is there’s been a lot of rumors about things that have gone on in our office over the last five weeks and I just want to say a lot of these people are here today. I think the last five weeks have affirmed that I believe in the people of our organization. People worked tirelessly, selfishly to make sure nothing slipped through the cracks during this people in that I couldn’t be any prouder of the people I work with. I think we accomplished a lot during the last five weeks and it’s because people worked so hard and bound together in sort of an unusual time so again, I’m proud to work with those guys and I’m looking forward to doing so for a long time. And the last thing I want to say if I just want to thank Ben. Ben actually hired me with the Red Sox. We played against each other in college so we knew each other a little bit and he hired me and I couldn’t appreciate that any more. He gave me my start in baseball and I couldn’t be happier to be working with anyone else than Ben so I’m looking forward to it. It means a lot. GM Ben Cherington: Thanks Jed and Larry. Just to follow up on Jed’s premise, I hesitate to say this publicly but when we were in college, Wesleyan beat Amherst a little bit more than I would have liked so actually when we decided to hire him it was a lot less about him than it was about a way to get back at him but it’s worked out well and I fell the same way. One of the reasons that this is going to work with Jed and me is that, not only do we compliment each other well as far as our strengths, but we have an incredible relationship built on trust and that’s going to allow this partnership to work. I believe that not only are you only as good as the people you work with, you’re only as good as the people you work for. And we’re very lucky in the Red Sox organization, to work for an ownership group in John, Tom, Larry that not only has a broad and varied experience in baseball, but also has a very high intellect and a way of looking at baseball decisions in a critical manner and a manner in which helps baseball operations make decisions. And so we’re very lucky to have that and I’m honored that they shown the faith in me to give me this shared responsibility. Over the last five weeks, baseball operations has gone through a challenging period. We’ve had to rely on each other perhaps even more than we did before and we’ve done that I think with success. We’ve also done it in a way that I think our relationships are even stronger for it. Ownership’s decision, the Red Sox decision, to name Jed and me as co-GMs is a lot less about Jed and me and a lot more about our baseball operations department and I feel very strongly about that. That’s also why Jed and I feel so confident moving forward that we’re going to be able to do this job and be able to carry on the business of baseball operations for the Red Sox. Lucchino: In this press release we sent out to you today, John, Tom, and I tried to express the gratitude that we felt and we wrote it up at the end. We wanted to express our gratitude for the teamwork and good work done by everyone in the baseball operations department during this challenging offseason. In addition to the leadership of the ‘Four Horsemen,’ as they became known, that was the two of these guys plus Shipley and Lajoie, the Red Sox have been well served by Jeremy Kapstein, Bill James, Brian O’Halloran, Raquel Ferreira, Jason McLeod, Amiel Sawdaye, Galen Carr, Zack Scott, Jared Porter, and of course Jack McCormick and Jean MacDougall. We’re proud of their special efforts these folks have made over the course of the last several weeks, and we have every reason to believe that will continue to do a great job with the newly restructured baseball operations department as we move forward. So here’s a chance to thank all of you guys for the contributions you made for the last several weeks and it’s much appreciated by all of us in this organization. Hoyer: I think it’s a pretty natural division (of responsibilities). I’ve been working mostly on major league transactions, contracts, the last three years. Ben’s been working mostly on player development. So I think for now, we’re obviously going to have some overlap but we think it’s a pretty natural division with me working on major league transactions for the most part, professional scouting, Ben working on player development and amateur scouting. Lucchino: This is the arrangement we are going forward with in 2006. Will there be other changes, other additions? I think that’s always possible. My job, our job, is to put the best front office team that we can together so we have the best team on the field that we can have. As these gentlemen take over today, one of the first orders of business will be talking about additional and other personnel, and roles and responsibilities. So this is a step forward but we are not talking about the duration of contracts or the financial terms here. Ben has scouting, he’s got player development and he also has some major league relationships and responsibilities. He will cross over from time to time make no mistake. And Jed will do the same. The responsibilities are demanding enough, the job particularly in this city and in this setting is demanding enough, in our view, it made great sense given their personal compatibility as well as their experience, for them to do it together. Certainly it’s possible that it can be consolidated at some point, but at this point in time, we think it is better to divide it up this way. Ben’s duties are going to be far broader than simply being a farm director. His principal responsibility if for minor league affairs which means layer development, which means amateur scouting, which means international scouting, which means a whole lot of other things in the organization as well as the day-to-day administration of the department so and he will also of course work on a variety of major league issues as well. In our view those are just principal areas of focus but they are broad and demanding enough that there should be a specialist in each for now. We’ll see how it evolves over time. Any truth to the rumors that Theo’s coming on board as a consultant? Lucchino: I think that… it’s fairest to say that we’ve made a big step going forward today and we’ll see what happens in the future. Certainly Theo is a good friend of all of us up here and he’s worked with these guys closely in the past. Until… the door’s been really ajar for some time, and until Theo goes to work for another baseball organization, we’ll keep a light on in the window with the possibility of (his) coming back and helping us and working with us in this new structure… I know that these guys have talked to Theo with some frequency. They’re friends. I know we all have since Theo made his decision so I think it’s probably fair to say there have been some general discussions about Theo coming back in some way, shape, or form, but there’s been no final resolution. Hoyer: As Larry alluded to. We do talk to Theo on a regular basis. We’re good friends. I think it sort of stops there. We talk to him. We talk to him anyway. I talk Peter Woodfork a lot too. He’s a good friend of mine. I talk to Josh (Byrnes) a lot. So it’s really been in that nature that I talk to Theo. Cherington on recent trade activity: I think anytime we make a move, we’re going to look at what’s in the best interest of the franchise. In the Florida deal, obviously the key to the deal it’s no secret was getting Josh Beckett back. He’s a 25-year-old pitcher who has a chance of being a front-line pitcher for a long time. He’s only a few months older than Jonathan Papelbon to put some perspective on it. You don’t get that opportunity very often to acquire a pitcher of his age and his caliber. So that was the key to that deal. We feel very good about having him as part of our rotation. The Mirabelli deal… Doug Mirabelli’s been a very good backup catcher for us for a long time. Obviously he had a unique role in handling Wake, and a significant role in that. we felt it was an opportunity to get an everyday second baseman, a very good performer on the field, also a great guy in the clubhouse, a great guy in general who we felt could fit into our clubhouse, and in this market and the Renteria deal was more than anything else, again similar to Beckett, an opportunity to acquire a young, special talent in Andy Marte and those types of opportunities don’t come around very often. Lucchino: It’s premature to discuss exactly what role, if any, Theo would have… all we’re saying is we’ll keep a light on in the window, a door ajar, and if there’s a fit, we’d like to see it happen. There have been discussions since the day Theo declined our offer about him coming back and playing some kind of role going forward. We have talked about that and certainly John has and Tom has. Hoyer on what happens if he and Cherington disagree on any player moves: I’m sure we will at some point. We’ll both have strong positions. It’s incumbent on us to state our own points, our positions, and see if we can come to an agreement. We have a lot of other people in the office who have a lot of say, and clearly John, Tom, and Larry will have a lot of say on the things we discuss. I’m sure we will (disagree), but I’m sure at the same time I have no questions whatsoever going forward, we have a great relationship. We trust each other. And if we do disagree, I’m sure we’ll work our hardest to come to a resolution. Lucchino: We kind of like the notion of disagreement, of people speaking candidly and affirmatively about their position and doing some battling. That’s a good thing in our view in the process. At the end of the day there needs to be some resolution. Ideally, the baseball operations department will be able to resolve it somehow themselves if they get into that situation. These guys each have a primary area of responsibilities so there will be a presumption in favor in that person’s position in that area of responsibility. But if they can’t, that’s what John, Tom, and I are for… for the resolution of difficult decisions, major policy decisions, or major transactions. Cherington: There’s rarely a deal in baseball that’s a slam dunk. It’s just the nature of business. The deals that are out there to be had, if they were slam dunks they wouldn’t be there in the first place. There’s always going to be some amount of disagreement at least with parts of the deal, the job of the general manager is to use the people around them, use their opinions, get information. That’s going to be our job now. In the traditional arrangement, where there’s one general manager, it’s a little overplayed that that person makes all the decisions in a vacuum. , There’s always more than one person involved in a decision. Ownership is involved. The people in baseball operations are involved. Just because now the position is split for the time being, and Jed and I have the kind of relationship where we can rely on each other, we’ll serve as a system of checks and balances with one another to some degree but we’ll use all of those people we mentioned, ownership and baseball operations, to help make those decisions. Lucchino on what happens to Craig Shipley and Bill Lajoie: Both Bill Lajoie and Craig Shipley have done a phenomenal job for us over the years, particularly in these last five weeks where they have jumped in with both feet and have provided real guidance and leadership. I’d like to take a moment to thank both Ship and Bill for what they’ve done. They have great relationships with these two. I’m hopeful they will continue on in the organization working in this new set-up. They have major things to contribute and have contributed those things in the last several weeks especially. We’re hopeful the organization will go forward. Bill Lajoie is feeling a little under the weather today… he’s recovering a little bit from the extra efforts at the meetings last week. Hoyer: Bill and I are very close. I just want to say a few words about Bill. He is as good a scout as anyone in the game. Both Ben and I have learned so much from him over the last four years. He’s been just incredible during the last 40 days. This is something that, at his age, is very difficult to do, but he threw himself in with both feet and really welcomed the challenge of working with us. He was fantastic. I’ve talked to him a couple to times in the last few days and am excited to keep working with him. He is a great resource for us. He’s a huge part of this baseball operation. One thing we do feel strongly about is we want the strongest baseball operations office we can get and Bill Lajoie is a big part of that. Lucchino: The operation will continue to function the way it has for the past four years, since we’ve been here. We don’t envision major changes yet. We’re open to the possibility of discussion of other changes. These guys may have some thoughts and suggestions on how we can streamline the effort but in terms of general responsibilities, my role is going to stay the same. Actually I can back off a bit, the last five weeks or so I’ve been pretty busy working with these guys down there, this will give me a chance to back off a little now that we’ve got some clarity and organization down there. I don’t think it’s unprecedented. I think it’s unusual but at this point in time for the Red Sox I think this is a sensible way to go. It’s one we debated internally. We discussed the merits of outside candidates. How to structure things. We did have a healthy debate on it to be sure, but this is a decision we feel is appropriate for this team right now. If anything there seems to be a bit of a movement towards dividing up the responsibilities in baseball operations. I know the Orioles worked with co-GMs last year although they were not GMs who knew each other, worked together the way these guys had. I think Tampa Bay has divided up the offices of general manager and created a couple of different parts of it. So this is not unprecedented but it is unusual. Lucchino on fueling speculation that Theo will return by not disclosing information on the duration of the contracts for Hoyer and Cherington. We just think that it is better now to go forward with this structure. We made a commitment to these guys to be part of this organization for years to come. This is not a momentary kind of commitment to these gentlemen. We are going to go ahead with this structure, this arrangement, and see how it works. If it appears to work well for us, if it doesn’t, we’ll make changes. Our job is to make sure we have the strongest possible front office. The strongest possible baseball operations department. If there’s a better way to build a mousetrap, we’ll try that too. This is the way we’re committed to going now. This is what we want to do now. They (Ben and Jed) were key members of the leadership team during the transition team down there along with Bill and Craig Shipley. They have extensive experience with our organization. They have a philosophical compatibility with each other and with us. I don’t think there’s anyone in our organization, a single player, that both these guys don’t know very well. This is not going into their personal skills… their work ethic, their organizational abilities, the collaborative nature of their personalities, the just raw, intellectual talent they bring to the process. We were fortunate during this transition period to be served by at least four general managers. One had been a general manager, Bill Lajoie, who won a World Series as a general manager. The other two are these gentlemen right here who are co-general managers and will be in these roles in our organization, or with other organizations, for years to come, and Craig Shipley is another man who I think will at some point be a general manager in major league baseball. So we were well served by these folks and the leadership they provided. When it comes to free agents, we tend to double up where possible. Jed and I have been actively involved in the negotiations. When we met with Damon’s folks, Ben was also involved. Damon’s negotiations will continue to be under our domain. Would you personally like to see Theo come back? Lucchino: Our job is to put the strongest baseball team together and that follows from the strongest possible front office, from the strongest possible baseball operations department. And Theo is an immensely talented guy who has proved himself over the last several years here. If he is comfortable and happy and feels he could be productive in this organization, in this structure, we welcome it. Cherington: It is special. What makes it (special) is the people we work with. Hoyer: You grow up in New England, you know what the Red Sox are all about. Cherington: It was an opportunity to work with John, Tom, and Larry (over the last five weeks), develop those relationships. We’re grateful for their decisions. Hoyer: The Gang of Four worked very well. I have no question that the Gang of Two will work well also. Both of us realized this structure would work well for us. We trust each other. We like each other. Cherington: The job of working in baseball operations is very collaborative, it’s competitive. It becomes a little more public in nature. There’s a certain public nature to the Red Sox that’s necessary. Hoyer: There’s never an offseason for the Red Sox. What makes this job so great is how much people love the Red Sox. I talked to Theo about an hour ago. We talk a lot. I’m sure I’ll be in contact with him. Cherington: We had a strong relationship with Theo. I talk to him a fair amount and I’m sure I will continue to. Hoyer: We continue to talk to Scott (Boras on Damon). With Manny, if we can work out a trade, fantastic, but we will only do something that will make sense for the Red Sox. Cherington: We prefer not to comment on any direct contact we’ve had (with Roger Clemens). Cherington: We expected that’s where most of the questions would go (regarding Theo’s return). I don’t want to speculate on whether he would come back or not and what role he would have but no, neither Jed nor I pursued this job and so there wouldn’t be any disappointment in working with Theo no matter what the role he’d be in, but again it’s premature. This arrangement only works because of the relationship I have with Jed, and the relationship I have with baseball operations (people). Theo was at the public face of the decisions but the decisions are always made collaboratively. There is a natural division of our responsibilities because of our experience base. I have been more involved in player development. Jed will be probably a little more involved talking to clubs about major league moves and I’ll be a little more involved in player development. Because of our relationship, this is not adversarial, any decision we make will be done because we think it’s in the best interest of the Red Sox. We all have our titles but we all work within 20 feet of each other and have a good knowledge base of the entire organization. Neither of us pursued this position. A lot of us in baseball operations aspire to be a GM someday. We’ve been asked to do a job and we’re gonna do it for as long as they want us to do it. Any time in any company when there is an important figure in the company leaves a company there’s a lot of speculation about what’s going on inside. The reality over the last five weeks is those of us in baseball ops continued to do our job. It’s not really true that there was any sort of uncertainty internally. From a public standpoint, it’s important to give some continuity.